Leavis at the Jousters in The Lost and Damned. Leavis, credited as Maitre D, is a character in the HD Universe who appears as a minor character in The Lost and Damned. He is voiced by Robert Blumenfeld. 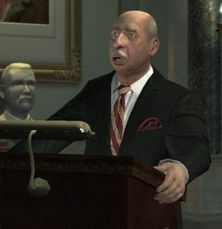 Leavis, in 2008, works as a maître d' at the Jousters Gentlemen Club, being prominently featured in only two mission cutscenes during which he serves as the first person whom Johnny Klebitz meets whenever he enters the club. Leavis' sophisticated British speech and choice of profession serving the rich is met with disdain by Johnny, who views him as outdated and subversive. Johnny initial encounter with Leavis and his criticism of his lifestyle leads Leavis to attempt turning him away, until Johnny clarifies that he wishes to see Thomas Stubbs III, to which point Leavis warms up to Johnny and leads him to Stubbs. In their second and final encounter, Johnny engages with Leavis in a brief discussion about whether their lifestyles bring them happiness, and the two resolve that one can be content in their own way. Leavis's name is a play on the two words "Leave Us". This is ironic, considering that a maître d'is supposed to welcome over people, not send them away. ↑ Leavis: "I think you should leave, sir, before I call the police." Johnny: "'I think you should leave, sir, before I...' Dude, it's the twenty-first century. Let me tell you something...You've got a job wiping rich pricks' asses, and for some reason you seem a little pleased with yourself. ", ("Politics"). ↑ Johnny: ..."Hey, let me ask you something... Do you really enjoy life?" Leavis: "I don't really know what you mean, sir." Johnny: "I mean, does serving all these rich morons, you know... smell of money and all that stuff, you know, does that make you happy?" Leavis: "Yes, sir, something like that. And tell me, sir, are you happy? I mean, has giving the man the, err, finger, really satisfied some inner urge within you, sir?" Johnny: "Well, I think what I've learned is that there's always a man, dude. He just wears a different uniform." Leavis: "As you say, sir."... ("Off Route"). This page was last modified on 7 December 2014, at 00:23.